Twitter is part of my personal life and a big part of my job here at the agency. But, when you’re following hundreds of thousands of users, as we do on behalf of our clients, the Twitter timelines can become pretty chaotic. Twitter has an algorithm in place to try and help you out, but when the average lifespan of a tweet is only 18 minutes, you can miss a lot of great content from the users you have chosen to follow or care about most. That’s where Twitter lists come in. If you haven’t utilized them before, Twitter lists are a great way to segment your Twitter audience. The lists essentially create mini newsfeeds to monitor content shared by the users in each list. Your Twitter lists can be accessed from the drop-down menu or by clicking the Lists tab on your profile page. 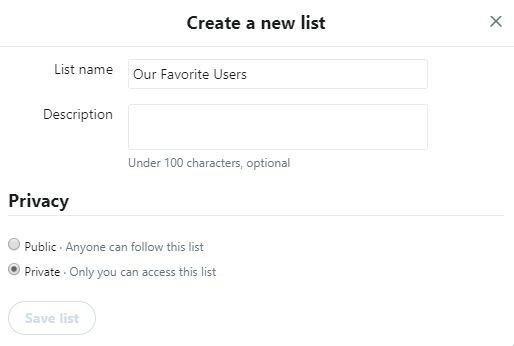 To make your own Twitter list, start by clicking “Create new list.” Give your list a name, write a description, and select the privacy for that list. You can change the privacy once a list has been created. However, think about the purpose of the list and if you want others to see it. If you have a public list, users will be notified that they were added to your list and Twitter users can subscribe to it. However, if you have a private list, users won’t be notified that they were added to the list and no one will be able to see or subscribe to the list. Both are valuable options, depending on your goal of the list (more on this privacy strategy later when I dive into the different types of lists you may want to create). Now’s the fun part. 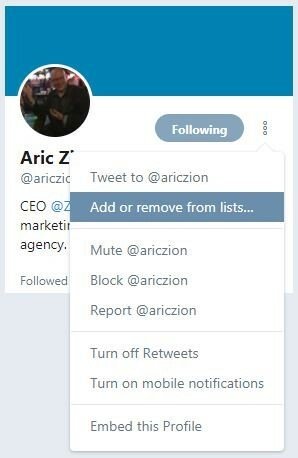 To add a user to a Twitter list, click the overflow icon (the icon represented by three dots) on a user’s profile and select “Add or remove from lists…” Once selecting this, a pop-up will appear with all your lists. You can then simply check to include the user in a list, or uncheck to remove them. Twitter allows you to add a maximum of 5,000 users to a single list. Twitter lists are great for working in tandem with your company’s goals. Specifically, Twitter lists can aid in business research, customer service, and relationship building. Create a list specifically for the industry you operate in. For Zion & Zion, we created an industry list and filled it with news sources and thought leaders in the marketing field. We included Twitter users like Mari Smith and Ann Handley in our list, plus resources like Search Engine Journal and Adweek. Industry news lists are a great place to go often to read about the latest trends in your industry so you can apply them to the work you do. Who are the leading companies in your industry? Add them to a list! In Zion & Zion’s list, we have competitive leading agencies in our space like SapientRazorfish and Droga5. In addition to checking out what the top dogs are up to, this resource is a great tool when starting out on Twitter to get a sense of what works and to gain inspiration. David Ogilvy once said, “Study the methods of your competitors and do the exact opposite.” In business, knowing your competition and what they’re doing is always a good idea. That’s why we suggest creating a Twitter list with your direct competitors. Friendly reminder, you don’t need to be following a user on Twitter to be able to add them to a list. And remember—you may want to keep this list private. Do you have a potential client you’d like to sign or customer you’d like to work with? There’s no harm in adding these individuals or companies to a private Twitter list. Reference this list and interact with your prospects whenever possible. They’ll be sure to start recognizing your company’s name to keep in the back of their minds when you reach out to them later. Doesn’t everyone love those customers who are super gung-ho about their business? We know Zion & Zion and our clients do. Add Twitter users who have mentioned you in the past, shared photos, or gave a rave review to an advocates list. Once they’ve been added to the list, show these users you care by liking or retweeting things they share about your business or by even responding to something unrelated. These simple interactions show the human side of your brand and helps keep them as loyal customers for life. While you can’t make everyone happy all the time, you can do your part to help diffuse any potential fires. Create a list with anyone that has talked negatively about your company in the past, whether directly by mentioning your brand, or indirectly. Doing so will help you keep tabs on risky individuals and act as soon as anything negative comes from their page. A Twitter list with your clients or customers is perfect for maintaining a relationship with them. Stay up-to-date with what they’re up to and interact with them by liking, retweeting, or replying to what they post. At Zion & Zion, we love to consult our client list often to help promote them on Twitter. Stay connected to your employees to learn what they’re passionate about or interested in. This list is also a great place to go to retweet and interact with tweets employees make about your business or industry. 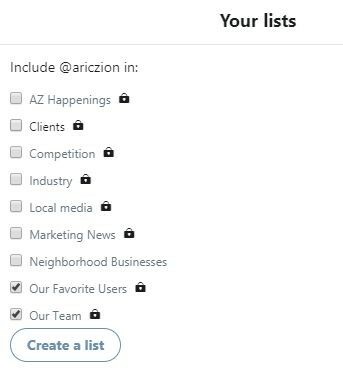 Zion & Zion uses our employee Twitter list to retweet industry-related posts our employees make, which helps position them as industry leaders and promote the great people behind our agency. If you want to work on growing your Twitter footprint, building a public list for your community neighbors is a great tactic. Localize yourself by adding businesses and other profiles in your community and by interacting with them. Check out our Neighborhood Businesses list for great profiles around us in Tempe. Pro Tip: Use Twitter’s advanced search feature to help find profiles near your location. Make sure your name is known in the industry you operate in. Interact with fellow businesses and industry leaders by participating in their Twitter Chats, for example. An industry Twitter list, like the industry leaders and industry news lists mentioned previously, is the perfect opportunity to network and make sure your business and its capabilities are shown. OKAY, I HAVE AWESOME LISTS SET UP. NOW WHAT? Go forth and conquer, young grasshopper. But, in all seriousness, good work. A tool is only as good as its user, so now that you have these tools in your arsenal, put them to use. Make monitoring your Twitter lists a regular part of your community management. I like to browse through them a few times a week when I’m already on Twitter. For me, they have been a great source for ideation, research, customer service, networking, and more—and I hope they are for you, too!